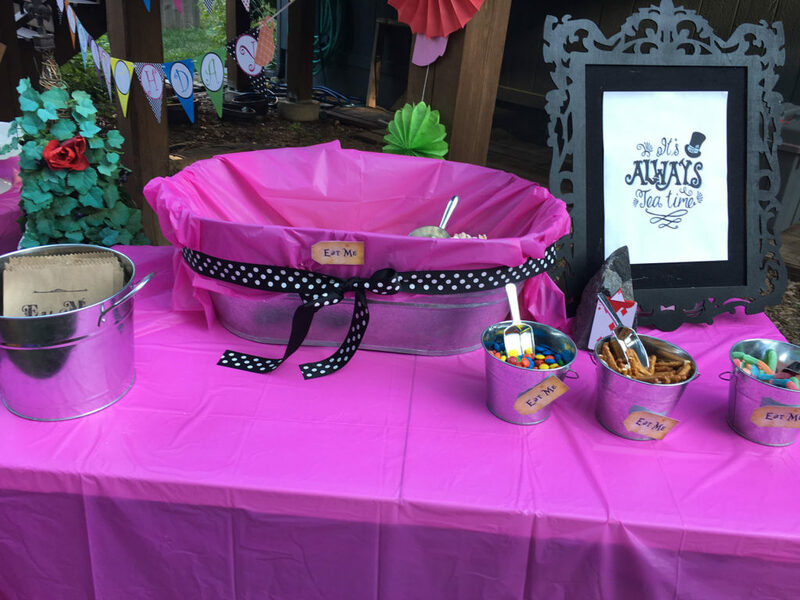 I work with the teenage girls at our church and as a way to celebrate all of their birthdays, we decided to throw an Unbirthday Party. 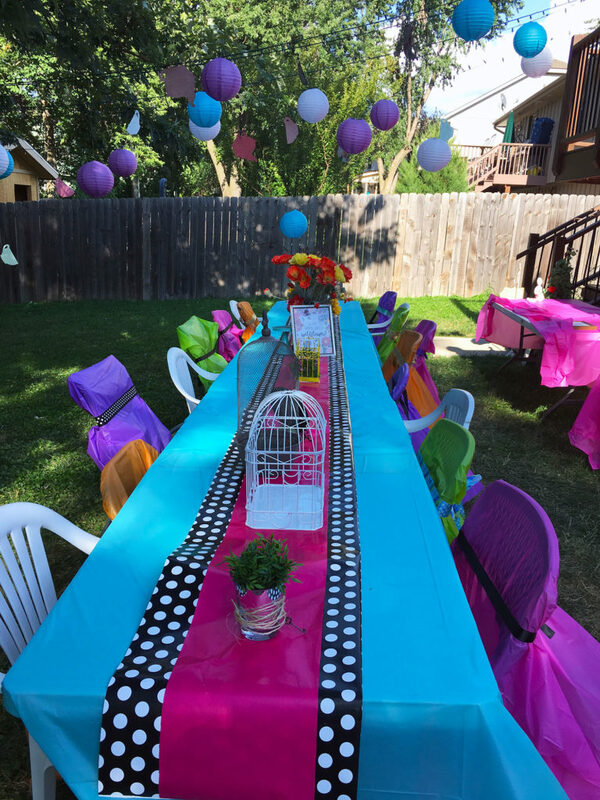 We went with the classic Alice in Wonderland Unbirthday Party, but instead of using vintage muted colors (there are a lot of those out there in Pinterest land and they are pretty) we decided to go for bright and bold. It was awesome. 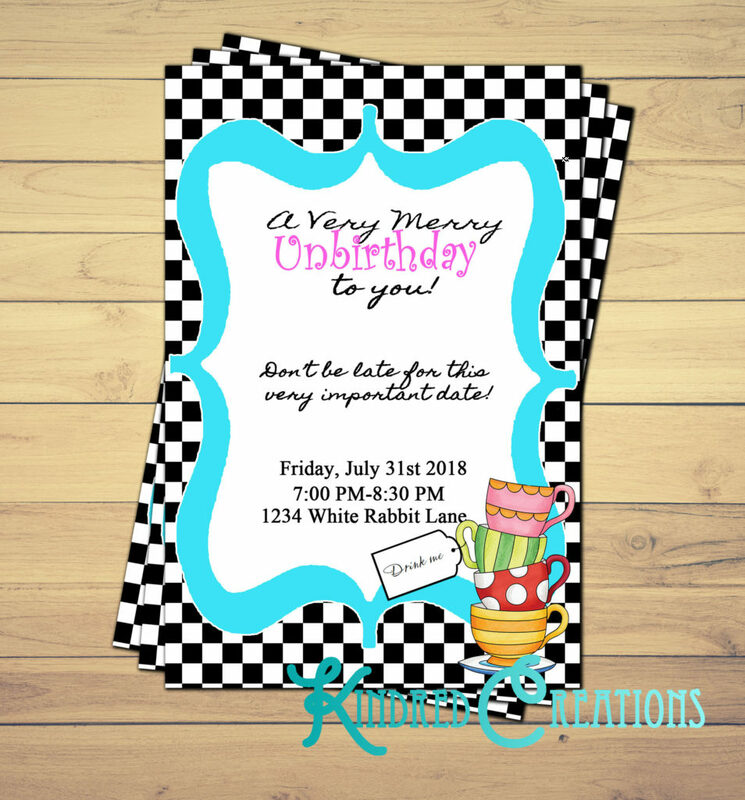 First there was the invitations. 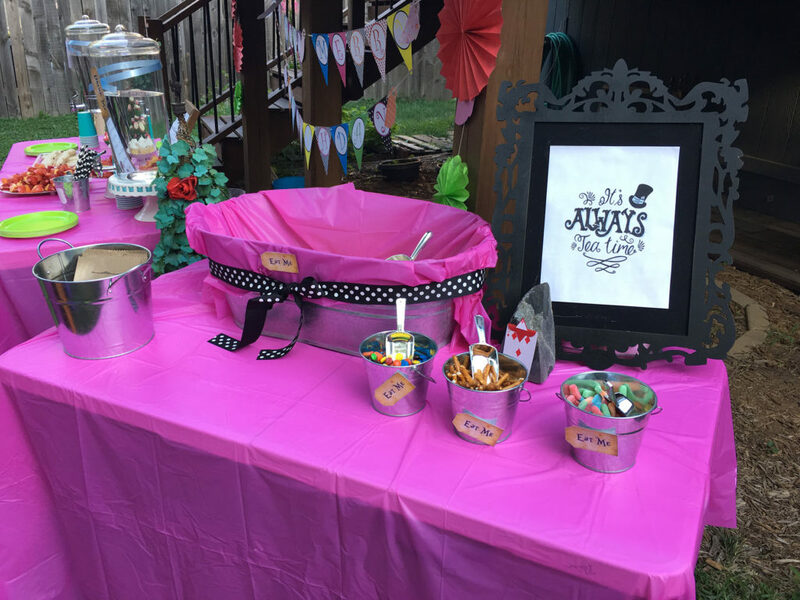 If you are interested in purchasing a version that you can edit for your own party it can be found here: Kindred Creations. For decorations we wanted to recreate the crazy whimsical feel of the Disney movie scene of the tea party, so we put three long tables together and put on tablecloths and a runner to make it look like one big table. 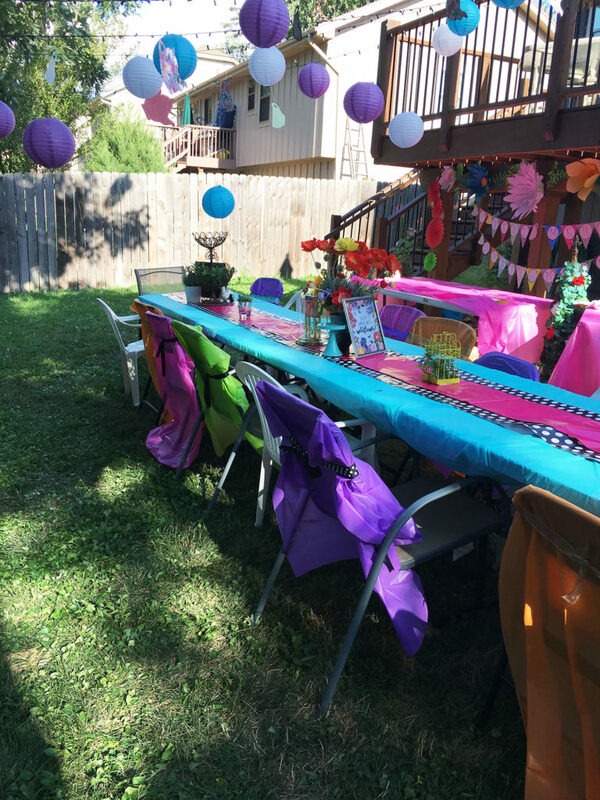 It was kind of a breezy day, so we had to use a lot of tape to keep the tablecloths from blowing around, but it worked. The adorable polka dot runner is actually wrapping paper. Super easy to make it any width you want and it’s way cheaper than fabric. 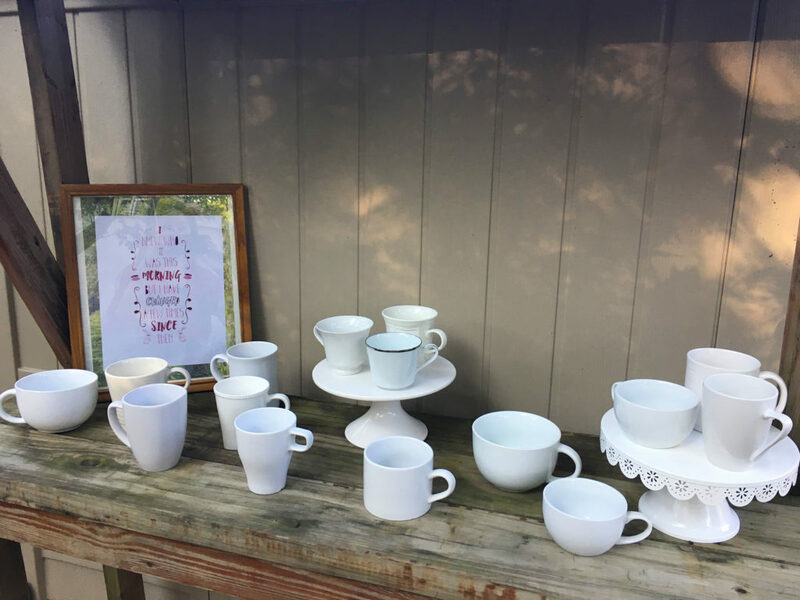 We strung white Christmas lights from the deck to a tree over the tables and then hung paper lanterns and paper teacups and tea pots from the lights with clear fishing line. It made it look like they were floating which was very fun. We used some plastic table cloths cut in thirds and wide ribbon to make “chair covers” for our boring folding chairs. It added more color and whimsy. For the table we borrowed/brought items everyone already had that we thought would fit the theme well, like clocks, rabbits, bird cages, cake stands, plants and flowers. 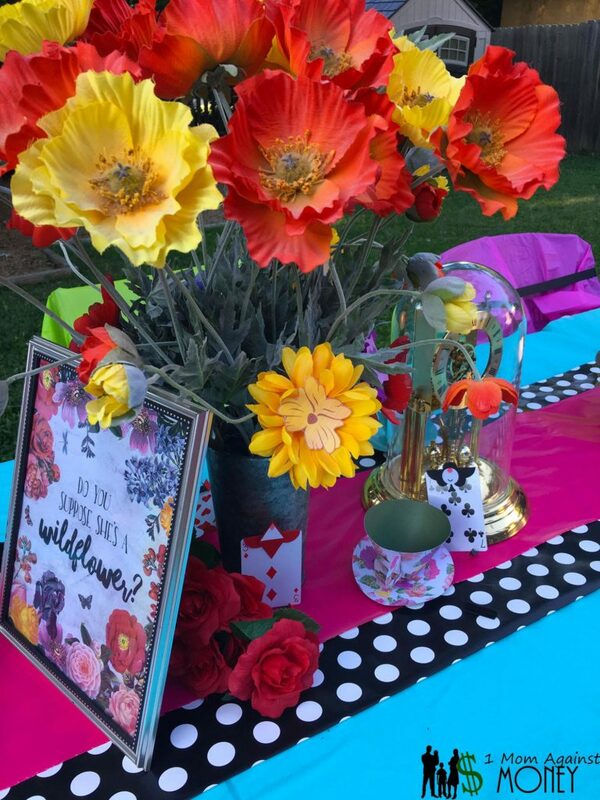 We also made a few items to add to the centerpieces. The flower faces were something I found online through Disney. You can find them here: Disney Family Website. I just printed them on cardstock, cut them out and found flowers with the right colors (I had some already and I got a couple from The Dollar Store). Then I just used glue dots to stick them to the center of the flowers. The glue dots came off pretty well afterward, so I’ll be able to use the flowers again! I also found a great tutorial on how to make the Playing Card Soldiers. You can find it here: Playing Card Soldiers. The quotes in the frames were also something I found online and printed off. They can be found here and, here. There were so many fun ones already available online, I decided not to reinvent the wheel. Plus we were a little bit on a time crunch (we only had about 2 weeks to get the party all ready). But someday I would love to spend time making posters of quotes from Alice in Wonderland, there are just so many good ones! 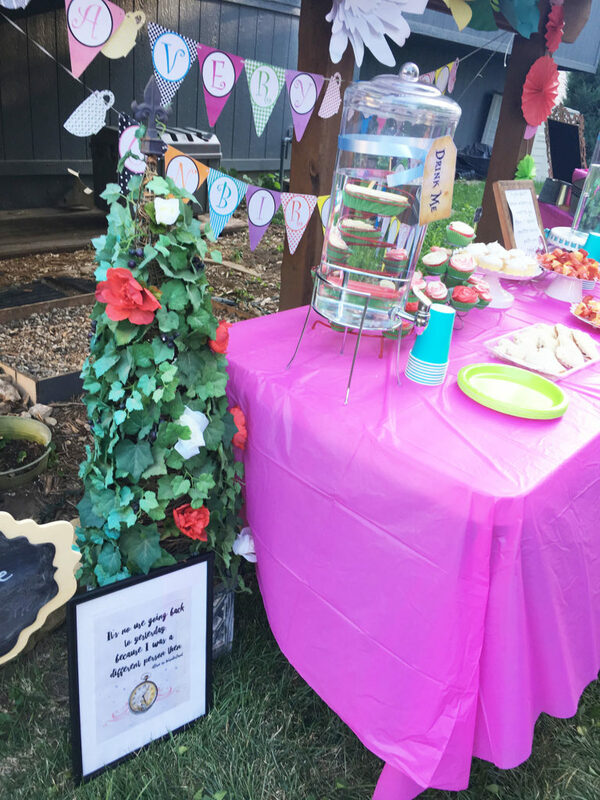 The food tables didn’t have a ton of decorations because the food was super cute. 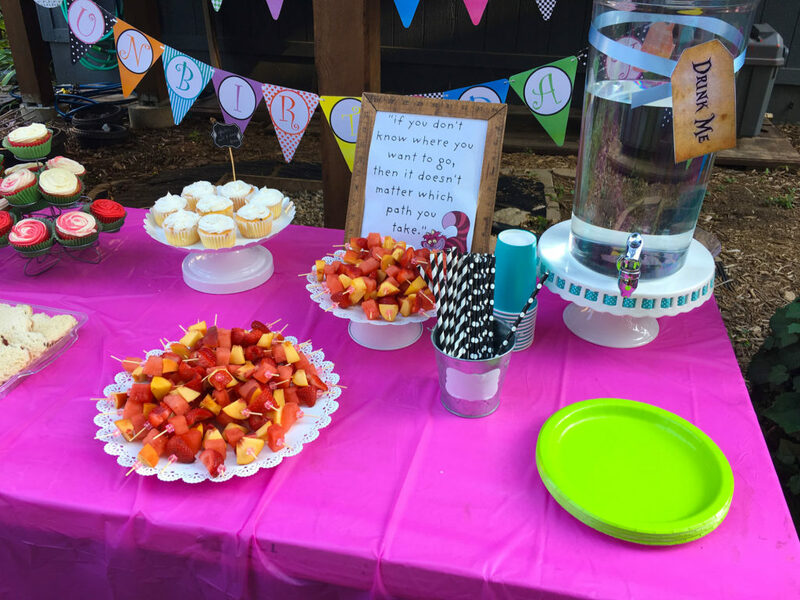 One of the other leaders made cupcakes that looked like the partially painted roses, fruit kabobs, and finger sandwiches. I made some small tags that said “eat me” and two large ones that said “drink me” to tape onto the water dispensers. 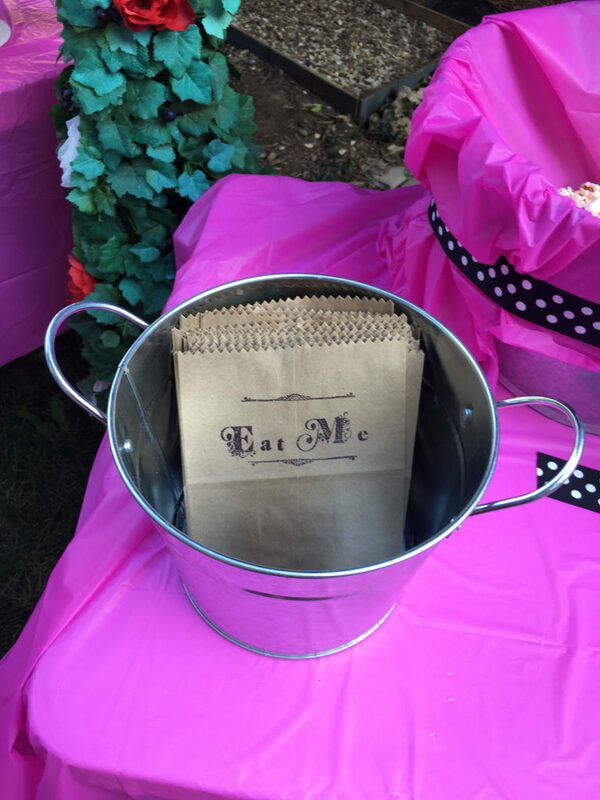 We had a popcorn bar and used letter stamps to put “eat me” on the bags for the popcorn. Behind the food table we decorated with a banner that said “A Very Merry Unbirthday!” It can be found in the shop as well: Kindred Creations. 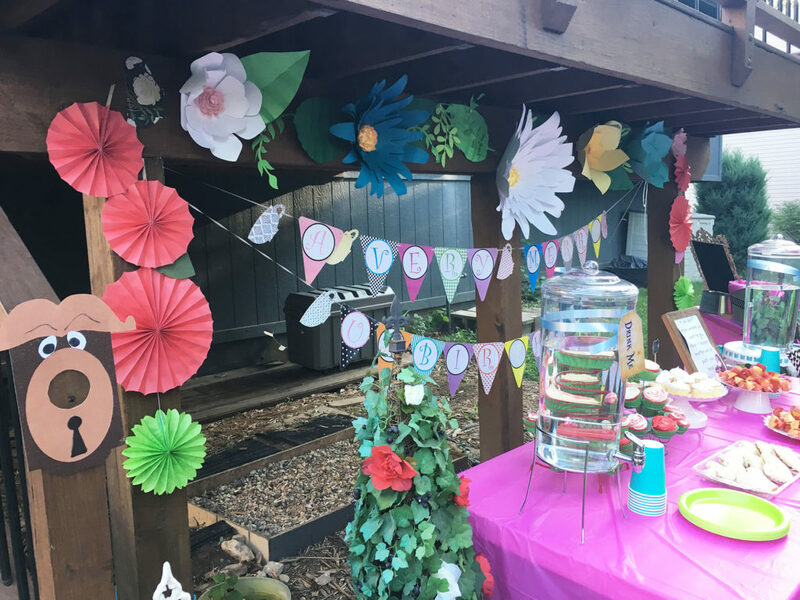 We also put up giant paper flowers and paper fans. The giant paper flowers were left over from a previous church activity and we borrowed them from the person who had made them. 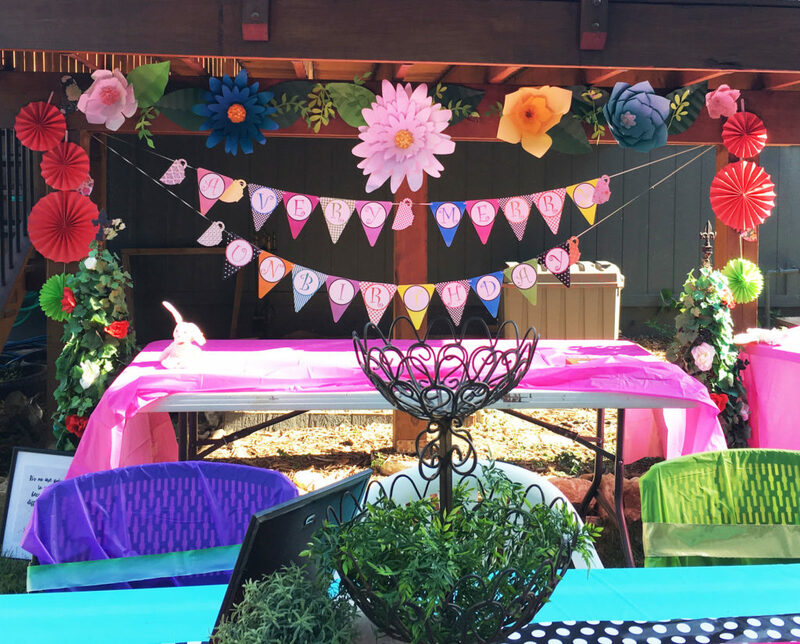 There are tons of tutorials online for making these and I felt like they made the party area feel extra special. The doorknob was made by one of the other leaders and I just love it! 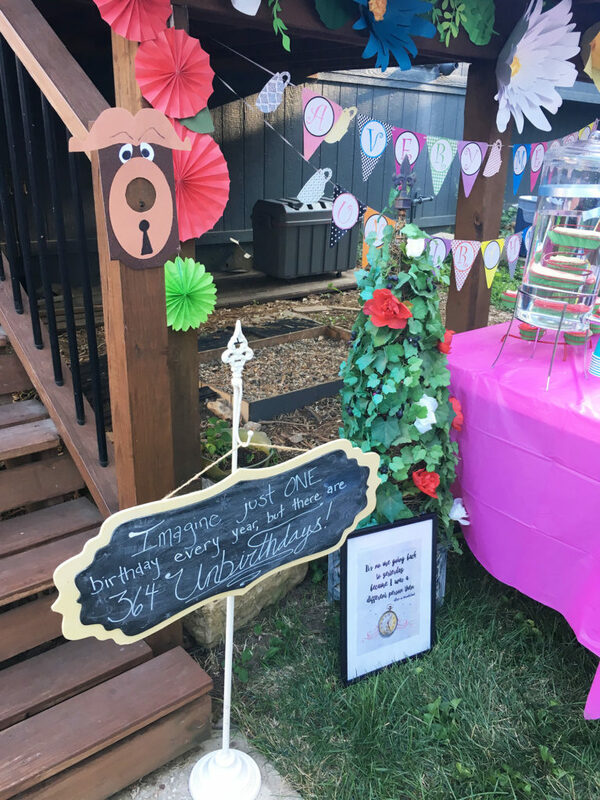 When we started talking about this party, I just knew that I wanted to make a sign that resembled the tree in the woods with the Cheshire cat. 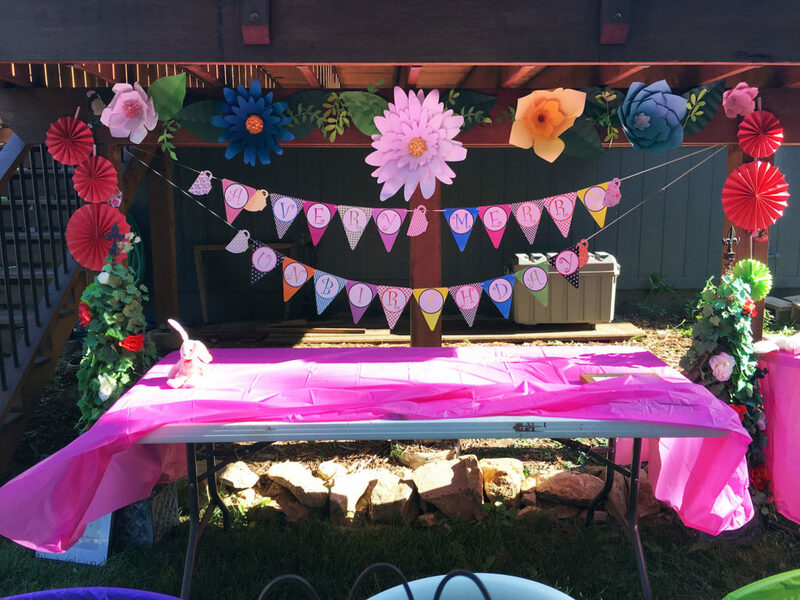 I thought it was an awesome party decoration addition. 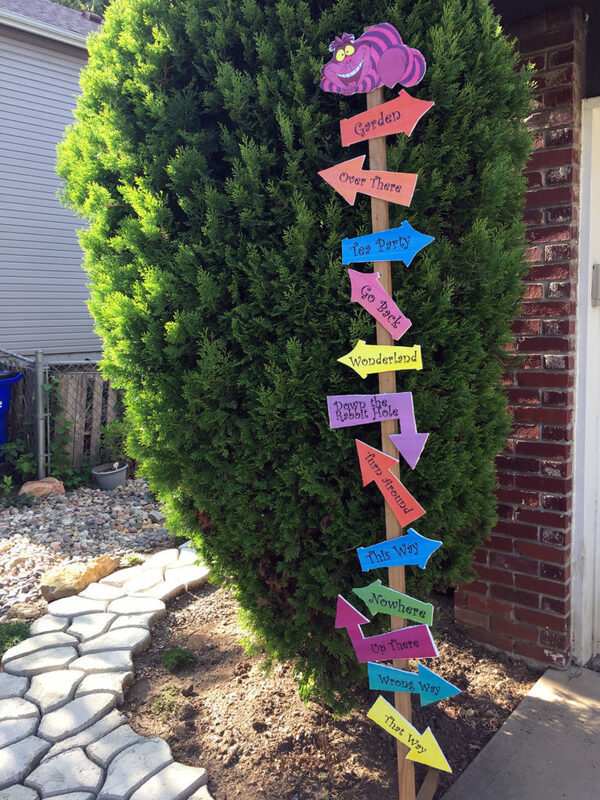 I printed the signs on regular paper and then glued them to foam core with Mod Podge. Then used an exacto knife to cut them out. 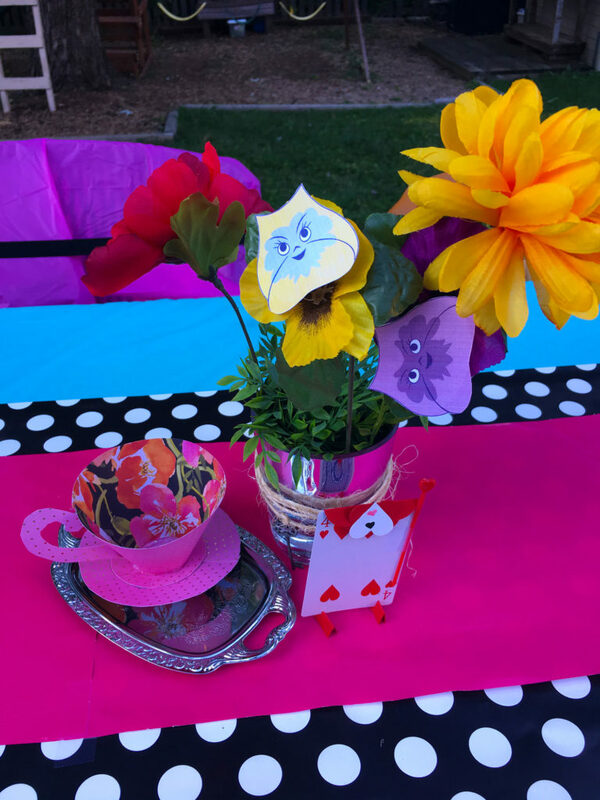 As one of the activities, the girls decorated their own “tea cup” (so a lot of these are mugs but it was just as fun). I found the cups at local Thrift Stores and I like the fact that they were all different. We used oil based sharpies to decorate the mugs. The girls left their cups with us and after they had dried for 24 hours we baked them following the directions on the Sharpie package. That made it so that the ink was dishwasher safe. Our other activity for the party was “Name that Disney Tune”. We played short sections of a Disney song and the girls had to give us the name and the movie it was from. Some of them were really tricky, but the girls figured out every single one eventually. Then we just enjoyed food and talked. I think everyone had a good time.